^ 2.0 2.1 Alain Jaubert. Making People Disappear An Amazing Chronicle of Photographic Deception. Pergamon-Brassey's. 1989: 109. ISBN 978-0-08-037430-7. ^ 3.000 3.001 3.002 3.003 3.004 3.005 3.006 3.007 3.008 3.009 3.010 3.011 3.012 3.013 3.014 3.015 3.016 3.017 3.018 3.019 3.020 3.021 3.022 3.023 3.024 3.025 3.026 3.027 3.028 3.029 3.030 3.031 3.032 3.033 3.034 3.035 3.036 3.037 3.038 3.039 3.040 3.041 3.042 3.043 3.044 3.045 3.046 3.047 3.048 3.049 3.050 3.051 3.052 3.053 3.054 3.055 3.056 3.057 3.058 3.059 3.060 3.061 3.062 3.063 3.064 3.065 3.066 3.067 3.068 3.069 3.070 3.071 3.072 3.073 3.074 3.075 3.076 3.077 3.078 3.079 3.080 3.081 3.082 3.083 3.084 3.085 3.086 3.087 3.088 3.089 3.090 3.091 3.092 3.093 3.094 3.095 3.096 3.097 3.098 3.099 3.100 吴葆朴、李志英. 《秦邦宪（博古）传》. 北京: 中共党史出版社. 2007. ISBN 978-7-80199-6855. ^ 5.0 5.1 5.2 5.3 5.4 5.5 Pak-Wah Leung. 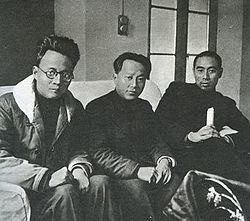 Political Leaders of Modern China A Biographical Dictionary. Greenwood Publishing Group. 2002-01-01. ISBN 978-0-313-30216-9. 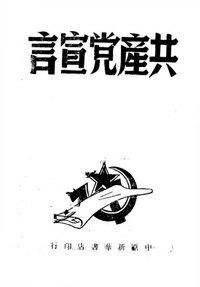 ^ 红色纪要, Volume 1. 西苑出版社. 2000: 217–219. ^ 杨奎松. 毛泽东与莫斯科的恩恩怨怨. 江西人民出版社. 1999: 34. ISBN 978-7-210-02127-8. ^ 张兴福; 王绍军. 红军长征全景实录. 解放军出版社. 2006: 17. ISBN 978-7-5065-5210-3. ^ Tony Saich; Benjamin Yang. The Rise to Power of the Chinese Communist Party Documents and Analysis. M.E. Sharpe. 26 December 1995: 522. ISBN 978-1-56324-155-0. ^ Lawrence R. Sullivan. Historical Dictionary of the Chinese Communist Party. Scarecrow Press. 16 December 2011: 318. ISBN 978-0-8108-7225-7. ^ Michael Dillon. Deng Xiaoping A Political Biography. I.B.Tauris. 30 October 2014: 62. ISBN 978-1-78076-895-3. ^ 博古; 李志英; 朱昱鹏. 博古文选 · 年谱. 当代中国出版社. 1997: 450. ^ Timothy Cheek. 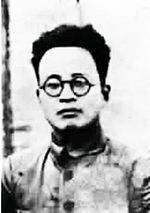 A Critical Introduction to Mao. Cambridge University Press. 23 August 2010: 92. ISBN 978-1-139-78904-2. ^ Stephen R. MacKinnon. Wuhan, 1938 War, Refugees, and the Making of Modern China. University of California Press. 21 May 2008: 67. ISBN 978-0-520-93460-3. ^ Kurt Werner Radtke; Chengzhi Liao. China's Relations with Japan, 1945-83 The Role of Liao Chengzhi. Manchester University Press. 1990: 51. ISBN 978-0-7190-2795-6. ^ Patricia Stranahan. Molding the Medium The Chinese Communist Party and the Liberation Daily. M.E. Sharpe. 1990: 5–8. ISBN 978-0-87332-662-9. ^ Joseph K. S. Yick. 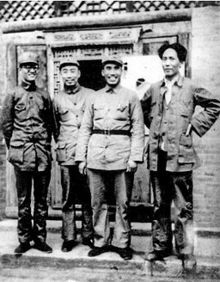 Making Urban Revolution in China The CCP-GMD Struggle for Beiping-Tianjin, 1945-1949. M.E. Sharpe. 1 January 1995: 184. ISBN 978-1-56324-606-7. ^ Chinese Studies in History. M.E. Sharpe. 1989: 32. ^ 24.0 24.1 博古之子忆父：24岁领导中共 延安整风中曾想到死. 凤凰网. （中文（简体）‎）. ^ 中国现代史. 中国人民大学书报资料社. 1997: 155. ^ Chinese Sociology and Anthropology. M.E. Sharpe. 1989: 120. ^ Far Eastern Affairs. Progress Publishers. 1979: 184. ^ 少华. 十一位牺牲在建国前的中共无衔军事家. 湖北人民出版社. 2005: 138. ^ 中国新闻年鉴. 中国社会科学出版社. 1999: 242. ^ 叶正大. 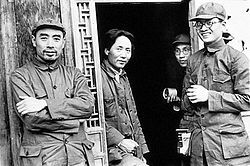 周恩来总理和我谈“四八”空难. (编) 马洪武. 叶挺研究文集. : 622. ^ Zui Shen; Meijuan Shen. 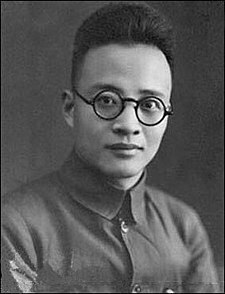 A KMT war criminal in new China. Foreign Languages Press. 1 August 1986: 220. ISBN 978-0-8351-1599-5. ^ 张庆军. 中华民国之谜. 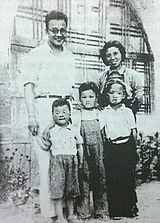 黄山书社. 2005: 262-263. ISBN 978-7-80707-165-5. ^ 悲怆人生 红色巨星大写真. 团结出版社. 1993: 304. ^ 红碑林 纪念为共和国捐躯的英烈们. 北方文艺出版社. 2000: 381–383. ISBN 978-7-5317-1314-2. ^ 郭德宏; 汤应武. 中共党史高层人物评传. 吉林文史出版社. 1999: 962–963. ^ 秦铁追忆父亲博古:历史给他安排的是一个犯错误的角色. 人民网来源：《新民周刊》. 2011年5月17日 [2014-11-07]. （原始内容存档于2016年3月4日）. ^ 博古之子忆朱德关怀：你爸是好人 从不搞阴谋诡计. 凤凰网. [2014-11-10]. ^ 新华社回忆录. 新华出版社. 1986: 94–96. ^ 文史博览, Issues 1-7; Issues 9-12. 《文史博览》杂誌社. 2009: 92. ^ 40.0 40.1 40.2 40.3 40.4 40.5 40.6 专访博古之女：父亲为父为子都“不合格”. 新华网. 2014年7月21日 [2014-11-07]. ^ 41.0 41.1 41.2 41.3 41.4 文摘報, Issues 300-377. 文摘報编辑部. 1986: 433.